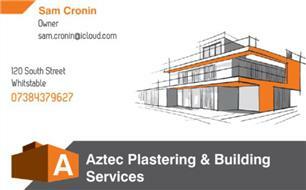 Welcome to Aztec Plastering & Building Services. With 25+ years experience in the industry we provide a clean, tidy and professional service. Our top goal is to meet every need for our customers so we can provide that personal finish to every house. And with all our work guaranteed and reasonable rates why not turn your house into your home. Call now for a fast, free estimate today.